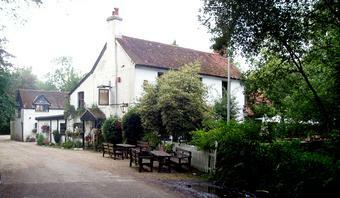 This pub has an idyllic location right next to the River Itchen. It is prime walking country. The interior has lots of individual rooms, around a central bar. But they have been modernised a little. The room I sat in had a collection of fish in glass cases. Being a Wadworth house, only their ales are sold - 6X, Horizon, Henry's IPA & Farmers Glory. It appears they normally have Westons Rosie's Pig as a real cider. But this was off on my visit. I was served by a polite young lady. But I was the only customer in the pub. A few others were outside. Food is served all day. Although it is a more limited menu during the late afternoon. Nice pub. Shame the ales were only Wadworths. Stopped here early April 2015, Lovely place, good pint of Wadsworth 6x, really nice warm welcome from the Landlady, Sarah. Excellent food, although as has been noted on earlier comments, a bit pricey, but really tasty. 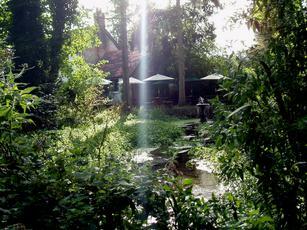 Beautiful location with a stream running past the pub garden, and a river just 20 yards or so from there. Great place for a walk and a pint afterwards. The pub has a large car park at the rear of the building and is located about 3/4 mile down a narrow(ish) lane off the A31. The day I visited it was really busy, (Sunday Lunchtime) so if you intend to eat here it's probably wise to phone ahead to reserve a table. I am not sure if the Landlady has changed from the previous comments, but I couldn't have wished for a better welcome. Good food, although service was slow. A local shop, sorry pub, for local people. (Royston Vesey come back!). Agree with the comments about the landlady? - needs to take a course on people skills. Great Pub in a great location, although the choice of Ale was limited to 3 Wadsworths The Farmers Glory was outstanding. Staff and Clientelle were very welcoming and I will not hesitate in visiting again next time I'm in the area.